There were twelve WRs who hit two of the three thresholds at the Combine. They are shown below, with the threshold they missed highlighted in red. Pretty much all of the Chiefs players, plus the two WRs the Bears signed in free agency, hit at least two of the three thresholds, so WRs the Bears target in the draft are likely to fall in one of these first two groups. The more high-profile names here are Christian Kirk and Courtland Sutton, both of whom are projected to go in the first two rounds. A late-round name from this list who intrigues me is Davon Grayson. He’s a smaller, shifty guy who I think profiles into this offense well stylistically. There were elevent WRs who hit 1 of the 3 thresholds at the Combine. They are shown below, with the thresholds they missed highlighted in red. Again, this does not mean these players will be bad in the NFL. It just means they don’t match the athletic profile of players who have recently succeeded in Chicago’s offense. Calvin Ridley has been a common projection to Chicago at #8 in mock drafts, but I just don’t see it. I’m sure he’ll be a good NFL WR, but I don’t think he’s a great fit for this offense (and I wrote this before they signed 2 WRs in free agency). Equanimeous St. Brown is an interesting case here, because he only did one of the three drills. His pro day (which is this Thursday) will be worth watching to see how well he jumps. He’s not a small shifty guy, but still has athleticism that could help him find success in Chicago (or anywhere, really). There are a few players here who surprised me because from watching them a bit before the Combine I thought they would fit well in Chicago’s offense. Those are mainly Keke Coutee and James Washington. 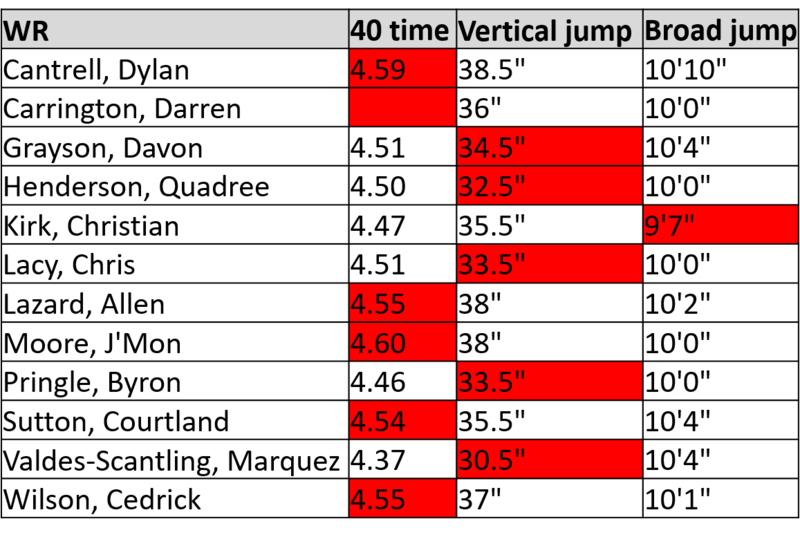 Washington came close on both his misses, while Coutee had a very poor broad jump. I still think Coutee could be a good day 3 pick for the Bears, because he’s a fast and shifty WR on film. I’ll be interested to see if the jump numbers improve at his pro day on Friday. 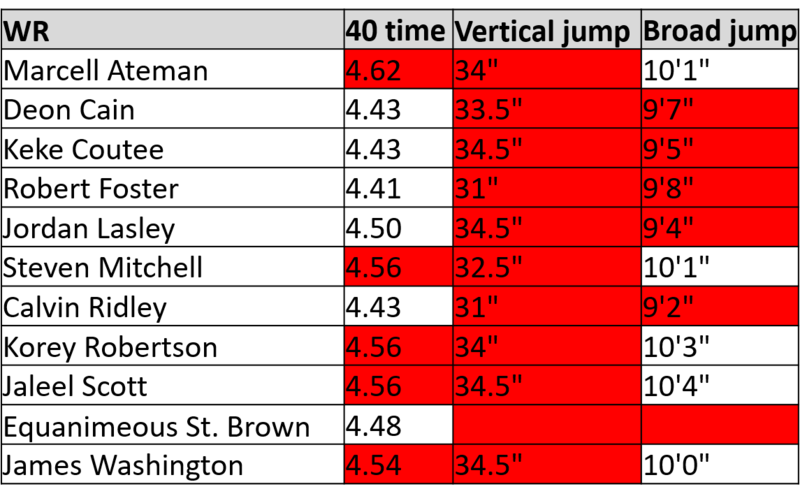 Washington actually crossed both thresholds at his Pro Day, posting a 4.49 second 40 and 39″ vertical jump, but he’s likely going to be drafted before the Bears consider taking a WR. Nine WRs hit none of the three thresholds at the Combine. They are shown below, with the thresholds they missed highlighted in red. Again, these are not all necessarily bad WRs. They just probably don’t fit in Chicago (have I emphasized that enough?). Auden Tate and Simmie Cobbs have both gotten some love as day 2 WRs, but most of these guys are viewed as later-round prospects. The only one who might match the Bears okay is Daesean Hamilton, who came close on both thresholds he tested but didn’t run the 40. He might be an option in round 4, and on film looks like he could fit fairly well in this offense, as he was pretty good at picking up yards after the catch. 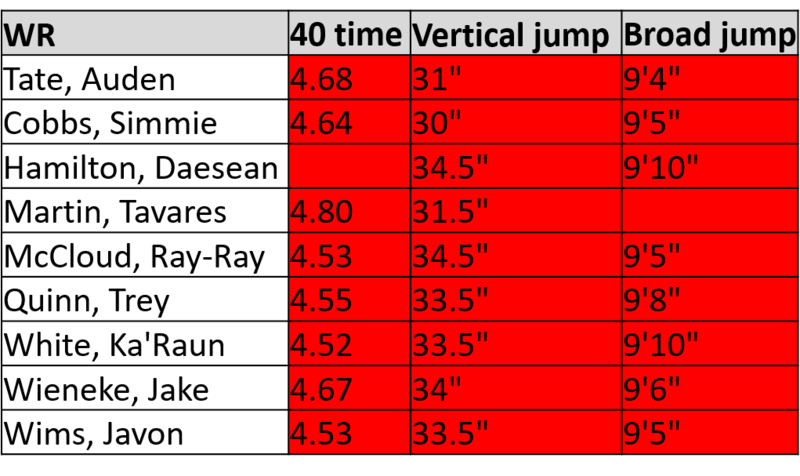 There were five WRs who did not do any testing at the Combine, and their pro days will be worth monitoring, because many of them are the type of player on film who should fit this offense well (small, shifty, good at yards after the catch). They are listed below. UPDATE 5/4/18: the Bears drafted Anthony Miller, who hit all three thresholds at his pro day with a 4.50 40 yard dash, 39″ vertical jump, and 125″ broad jump. I still have to watch film on several more guys who hit 2 or 3 of the thresholds, but right now here are some of my favorites for the Bears based on when they’re expected to be drafted. What WRs do you want to see the Bears target in the draft?